Razor clam is a name for long, narrow and saltwater clams. We have razor clams available which are made of the sword razor. This type of clam is also known by its Latin name, which is Ensis ensis. You can find the sword razor in the eastern part of the Atlantic Ocean, which is also known as FAO fishing area 27. One of the places where you can find razor clams in FAO fishing area 27 is at the coasts of the North Sea. Since this is close to the Netherlands we are able to catch most of our razor clams ourselves. After we have caught them we depurate them. This means that they are kept in clean and salt water to spit out the sand. In this way you will not have sand between your teeth when you eat the razor clams. After the razor clams are depurated we freeze them to keep them fresh. 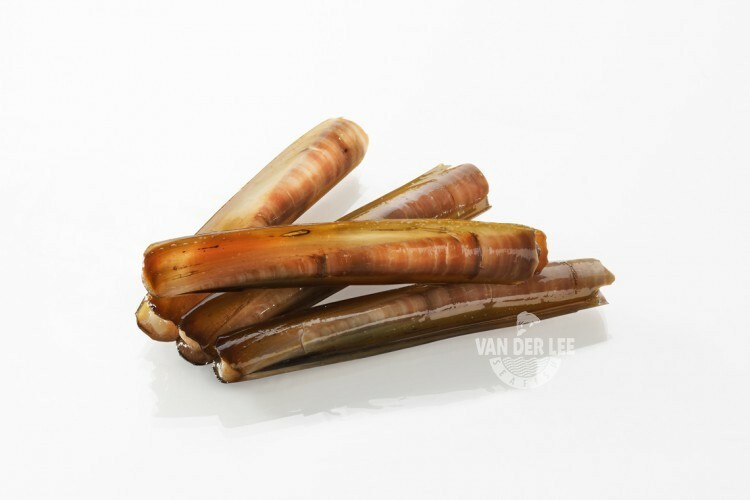 As a supplier we sell our razor clams with their shell. Razor clams have an unique texture and flavour. Their texture is quite similar to the texture of a squid and their flavour is very sweet. However, you should not cook them for too long since they will taste very tough if you do. Razor clams are quite low in calories since one hundred grams of them only contain about 92 calories. But this depends on the way in which you prepare them of course. Razor clams are a good source of proteins and they contain several B vitamins. They also contain some omega-3 fatty acids, which are good for your heart since they help preventing heart diseases. We mainly export our razor clams to the retailers and catering industries in Spain, Italy and the United Kingdom. But nevertheless razor clams are also popular in other countries. For example, razor clams which are caught in Scotland are often exported alive to Hong Kong. In this city the clams are regarded as a great delicacy. There are different ways to prepare razor clams. One way to prepare them is to cook them with crushed garlic cloves, parsley and olive oil. But you can also prepare them with sea salt, olive oil and lemon juice. Razor clams can be grilled, but most people prefer to pan-fry them. However, when you prepare them you should pay attention to the time and the heat, since razor clams must be cooked very quickly.